In 1957, Stock Equipment Company of Cleveland introduced the world’s first gravimetric coal feeder, a mechanical device that revolutionized almost every coal-fired electric power plant and other facility in the world that used coal-fired boilers. It both accurately weighed and controlled the flow of coal into a boiler in a single unit. Coal-fired power plants generate almost 40 percent of the electricity in the United States. They use coal that is much different from the big chunks that come straight from the mines. As demand for electricity grew in the 1920s, engineers redesigned the boilers in electric generating stations to burn pulverized, or powdered coal. Blown into the boiler furnace in a stream of air, powdered coal bursts into flame instantly and burns hotter and more completely than lump coal. This means higher efficiencies -- more energy out of each pound of coal -- than conventional combustion provided. 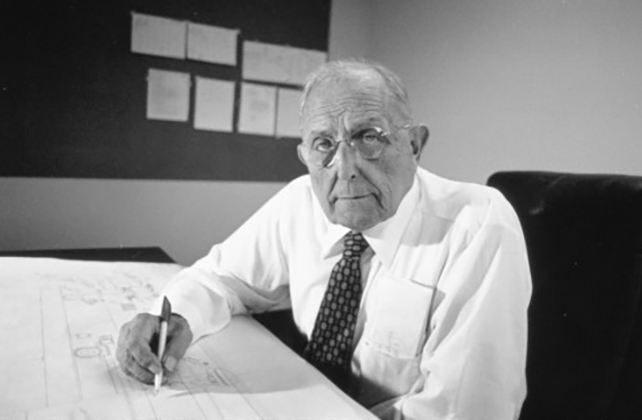 During this time, a mechanical engineer named Arthur J. Stock (1900-1986) began inventing devices to stoke boilers, or feed coal into them. He formed a company in Cleveland to build them. Click here for more on Stock and its history. In the 1930s, he introduced several new devices for the electric power industry, and the Stock Equipment Company developed a national reputation as a technological leader. His gravimetric coal feeder responded to two critical industry needs. One was a more accurate way to control the amount of coal fed into boilers. Popular films like Titanic may leave the impression that workers just toss shovels of coal into the boiler furnace whenever it looks like the fire is getting low. In reality, coal-fired boilers use precision devices to control the amount of fuel that goes into the pulverizer, devices which grind lump coal into powder. That is very important because boiler furnaces need the right proportion of fuel and air for most efficient combustion. Engineers call these devices "volumetric feeders," because they supply specific volumes or amounts of coal. The other need was a matter of bookkeeping. Electric utilities wanted to keep better track of the amount of coal used in each boiler. With that information, they could keep track of operating costs, figure out how efficiently each boiler was operating, and know how much coal to order to replenish their stockpiles. Many utilities began buying scales to weigh coal, and Stock was a leading supplier. Weighing units were placed in front of the volumetric feeder unit. These 2-part coal feeding systems were expensive, complicated, and became a huge headache for electric power stations. Sometimes, for instance, they got plugged up and coal stopped flowing freely. In the 1950s, Arthur Stock combined accurate weighing and coal-flow control systems into a single device, which was named the gravimetric feeder. He designed the unit to be simple and rugged, which meant high reliability. The first unit went into operation in 1957 at Niagara Mohawk Power Corporation’s Dunkirk (New York) Station. 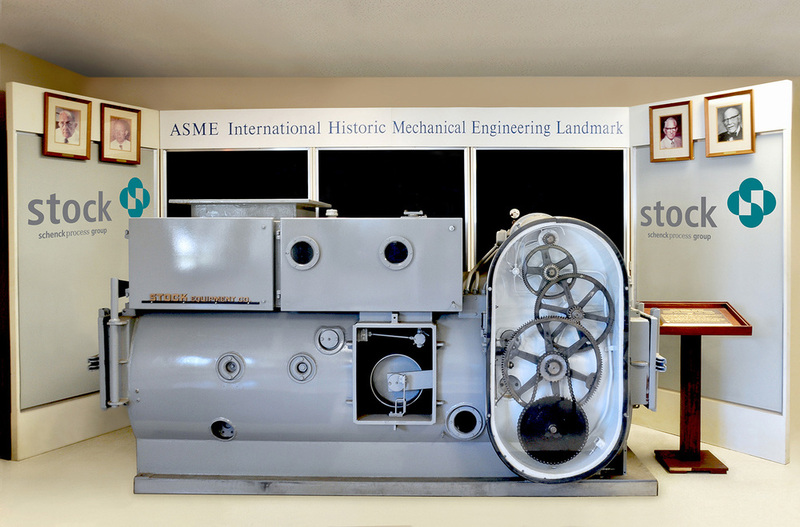 Design of the gravimetric feeder, which was designated as a technological landmark by the American Society of Mechanical Engineers, was ingenious. Download the ASME brochure, "The Stock Gravimetric Feeder" as a PDF file for more information. By mid-2015, more than 17,400 STOCK® gravimetric feeders have been installed worldwide since the initial Niagara Mohawk project, and they are the gold standard for feeding and metering solid fuel into boiler furnaces. An animation of a modern high pressure gravimetric (HPG) feeder in operation can be viewed here. Stock manufacturers the devices in the United States, Europe, and Asia. Today, Stock Equipment Company is part of the Schenck Process Group, Schenck Process Holding GmbH, headquartered in Darmstadt, Germany.